There I am, with my new wife in Greece and we see this Lemon flavored Jam, and she says, “ Oh, Andrew would love that and it’s his birthday soon. We should get him that." I was a little disappointed in myself. Here I am being Andrew’s Best Man in two weeks, and he my groomsman two weeks prior and I didn’t know that he loves lemons. Now my wife worked with Andrew, so she may have been more privy to this info. But still, I wondered if I was a bad friend. Should I have known this? I realized upon refection I can’t tell you Andrew’s favourite colour, favourite food, favourite book. Overall there is a lot that I cannot tell you. Yet we are close, we are very close friends, enough to be each other’s wedding parties. And why is that? Because of the talks we have had, the experiences, being there for each other in trying times and in times of celebration and just overall time spent on our relationship. I tell you about this experience because I believe that we can often loose focus in our relationship with Jesus. We get caught up in knowing things about him, and really what we know about Jesus does not define our relationship. Relationships are about intimacy, not just about knowledge of the other. 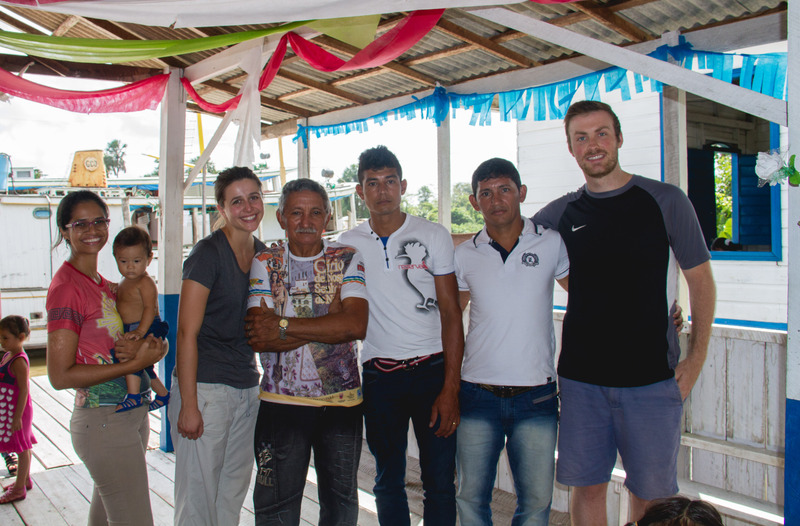 Shortly after Andrew’s wedding I went on a mission trip in the Amazon, to a town called Breves on Marajo Island. I saw something there that related to my experience and thoughts about my friendship with Andrew and my relationship to the Lord. The faith of the people on Marajo Island is amazing. When I went to Mass there I was shocked; the faith they had was so vibrant, so joyful, and so intimate. During Adoration they would want to be as close to Jesus as possible. They would leave their pew and come close, hands outstretched. They just wanted to spend time with him and be close with him. Their faith really made an impact on me. Their relationship was strong with Jesus, and you could see it. In Canada, I feel that we can lose the relationship-part of being close to Jesus in prayer. We start to think too much, our relationship becomes a checklist of what we know about Jesus. We need to know everything to make our faith stronger; we need to know apologetics, or the liturgical calendar. We need to know a lot about Saints, or a lot about the Bible. In Marajo Island, the people do not study saints, or apologetics in their free time. They just love Jesus. Now, I am not saying knowing things is bad. Learning and studying more about Jesus is a very good thing but, it should never be the center of our faith. We can still be best friends with someone even if you don’t know everything. But just like with Andrew, my relationship with Jesus is close because of the talks we have had, the experiences, being there for each other in tiring times and in times of celebration and overall time spent. What I learned from the people of Marajo Island is that faith is a relationship first; we need to focus on it, just like I do with my friends. I don’t need to know everything about him to grow in intimacy with him. But, it’s the effort, time and vulnerability I put in that matter. So today, lets try and be friends with Jesus, just talk to him in prayer. Talk to him as if he was your best friend. Because by talking to him and being close, we will gain intimacy with him, which I believe matters most. All the knowledge in the world wont outweigh a relationship. For more about CCO Missions, click here.